Almost all the Victorian-era watercolours in the Gallery’s collection are of a type commonly known as ‘exhibition-piece’ watercolours. These highly finished and technically elaborate productions were painted by professional artists (as opposed to the legions of amateur men and women) expressly for exhibition. Such works were the antithesis of the plein-air sketch or preparatory study, and marked a general break with the ‘pure’ technique of layered, transparent washes which dominated watercolour practice during the first half of the 19th century. 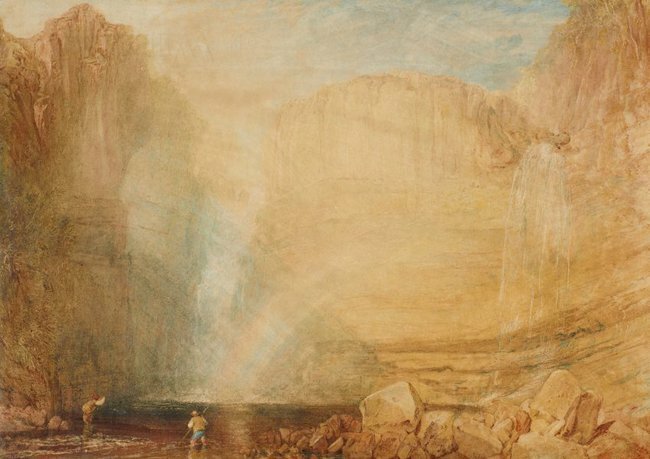 A good example in terms of technique and function of the earlier Romantic style is provided by the Gallery’s watercolour by JMW Turner, High force, Fall of the Tees, Yorkshire 1816, which was made for reproduction as a line engraving in Whitaker’s The history of Richmondshire, published in 1821. Certainly many early watercolours were made to hang in exhibitions but the medium was associated by and large with small-scale landscape and topographical work intended for storage in portfolios and available for close handling. 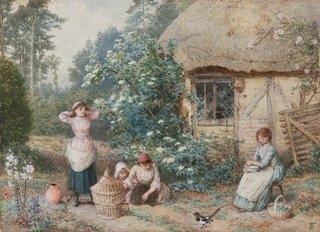 Most Victorian watercolour painters willingly forfeited the medium’s attributes of translucency, directness and suggestiveness to emulate the denser and more robust properties of oil paint with which they desired their work to be considered on equal terms. The most important stimulus to the development of highly wrought watercolours, and one of the crucial developments in Victorian watercolour practice, was the introduction in 1834 of zinc white (known as Chinese white). 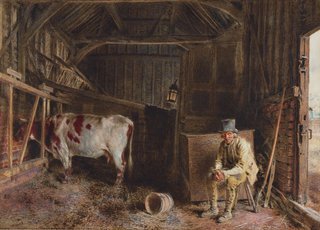 By mixing white with watercolour pigments, artists were able to create opaque colour or ‘bodycolour’ (also known by the French term ‘gouache’), which could be applied more thickly with the brush so that the white of the paper did not shine through. It was especially useful for creating vivid contrasts, stronger colour and more precise rendering of detail and texture. Meanwhile, watercolours began to reach unprecedented dimensions, with many exceeding a metre in length. 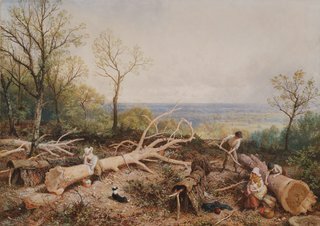 The Victorian preoccupation with size required artists to prepare their painting supports by stretching and fixing the paper to wooden backing boards. In many cases paper was attached like a canvas to a strainer before the unsightly paper edges were either trimmed away or wrapped behind. Artists also sought to give their watercolours greater prominence on gallery walls by presenting them behind glass in ornate carved and gilded frames with wide gold mounts, which emphasised the value of the works of art they surrounded and added to their ostentatious appearance (such as Charles Robertson's Bazaar gossip). 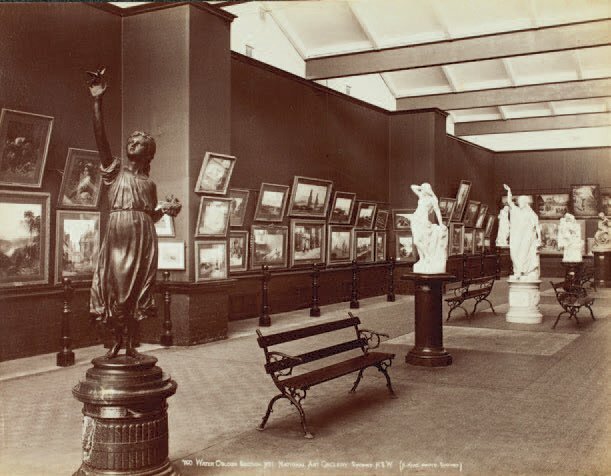 At the Art Gallery of NSW, as in a number of British galleries in the late 19th century, watercolours were hung in serried ranks on dark-coloured (usually red, crimson or maroon) walls in what were more or less permanent displays (see the images from the archive reproduced here). 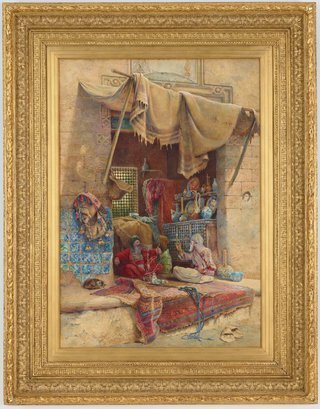 This style of picture hanging, though more decorative and restrained than the cluttered arrangements typical of the temporary exhibitions of the London watercolour societies, nonetheless appears to owe something to that tradition. 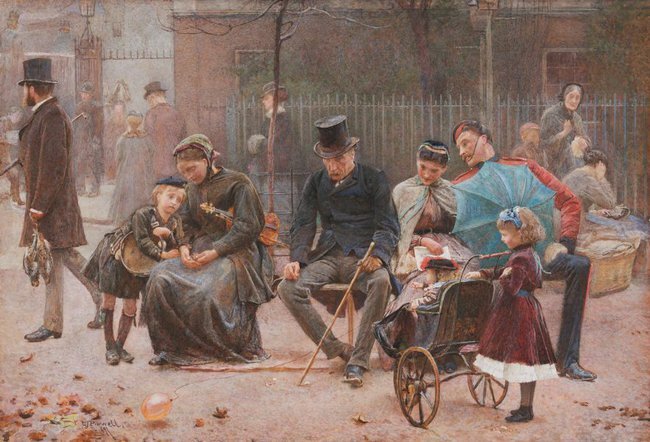 The illusion of comprehensiveness offered by the watercolour display in Sydney by the early 1890s aroused the delight of numerous commentators. The general sentiment was amplified by the painter Tom Roberts in the pages of the Melbourne Argus in 1891. Having described his favourite oil paintings in the Gallery’s collection he then proceeded to describe the watercolours at length: ‘For there is yet a treat reserved in the fine collection of water-colours, where we shall find examples of all styles and manners, from broadly painted to the most minutely worked’, before declaring George John Pinwell’s A seat in St James’s Park 1869 ‘the finest and most earnest of all the works in the room’. Yet the regrettable corollary of continuous display in sky-lit galleries for many watercolours has been the fading of their gentle colours. Ruskin, who advocated a system of responsible exhibition, expressed his concern about the preservation of watercolours in a series of letters to the press from the 1850s onwards. Of Turner’s works in particular he noted in The Literary Gazette that ‘those which have been in the possession of purchasers and exposed in frames are now faded in proportion to the time and degree of their exposure; the lighter hues disappearing, especially from the skies, so as sometimes to leave hardly a trace of the cloud-forms’. The most authoritative investigation into the conservation of watercolours was the government-funded Russell and Abney report on the action of light on watercolours, published in 1888, and spurred on in part by open criticism of the South Kensington Museum’s practice of displaying its important collection of watercolours continuously in full daylight. By 1882 the trustees in Sydney were also obliged to address the damaging effects of daylight on watercolours, and endorsed secretary Eccleston du Faur’s proposal to have curtain blinds fixed to the picture frames as a precaution against over-exposure. However, it appears from early photographs that the project was discontinued in subsequent years. There was also much discussion about the impact on fragile watercolours of hazardous atmospheric conditions inside the Gallery, an especially pressing concern in Sydney’s warm, humid climate. One ingenious first-aid solution to the problem of mildew growing on pictures on account of damp penetrating the walls was to affix sheets of leather backing to the framed watercolours, a treatment which, ‘during the late rain storms… saved them from all injury’. 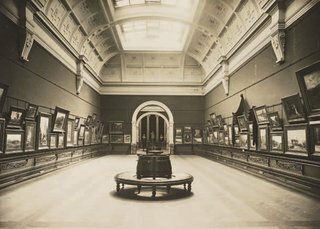 Eventually, in the modernising spirit of the new century, the Gallery’s Victorian watercolours were removed from display and put into storage where for decades they lay dormant. Most of the watercolours in the Gallery's collection retain their impressive frames, like this example on a work by Charles Robertson.